The router frequently hangs—about once every few days—and requires a reboot. Manually logging into the web interface to click the “reboot” button gets tiresome, and so I decided to see whether I could automate this with Keyboard Maestro. So the first problem to solve was how to test internet access on the non-default ethernet interface? Fortunately, the gracious KM author, Peter Lewis, discovered that the ‘ping’ command supports an option (‘-b’) to specify the network interface. Now that I could check if the router was down, the next problem to solve was programmatically rebooting it. The Tomato software, being a Linux distribution, supports SSH access, and Peter pointed out that if I install my SSH keys on the mini, KM could then login to the router without a password. That, and a little Googling, allowed me to figure out the KM text script needed to reboot the router via SSH. 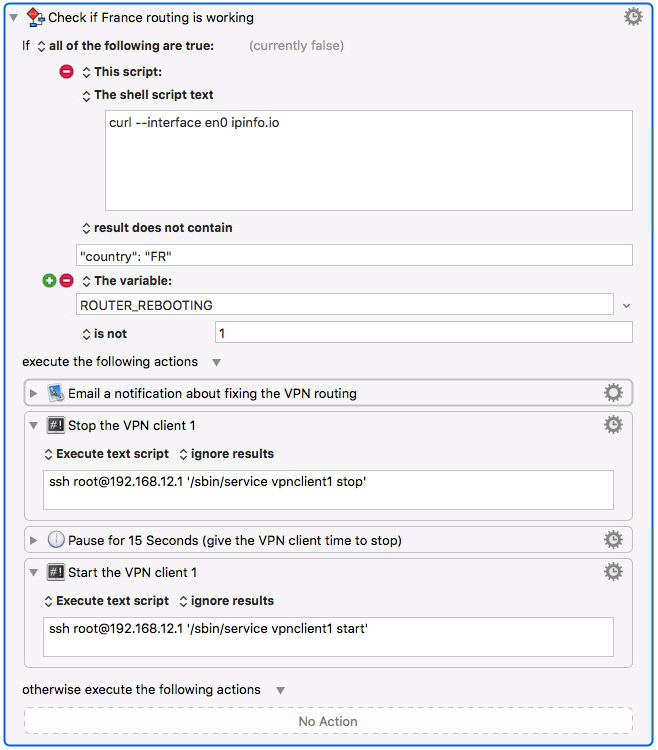 Now, you might be wondering what the ROUTER_REBOOTING variable is for. Turns out, there’s another Tomato-related issue I also solved with Keyboard Maestro. 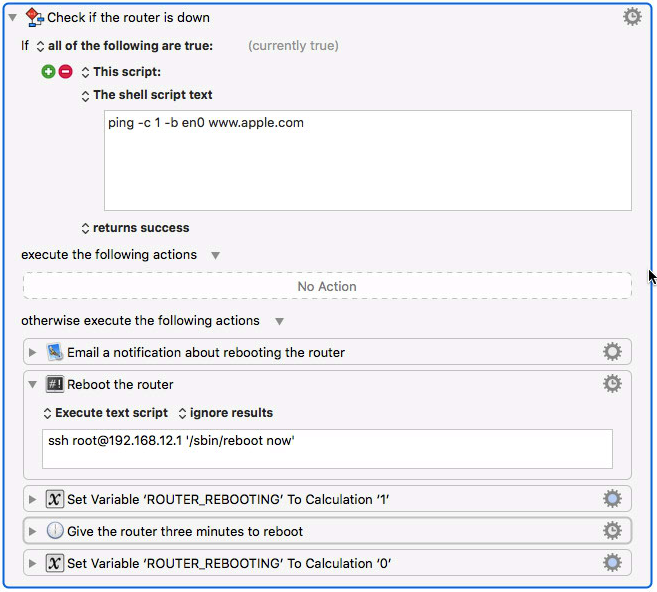 The Tomato router supports two VPN clients, VPNClient1 and VPNClient2. I have client 2 connected to a US-based VPN server, and route my AppleTV through that, allowing me to watch content that is IP-restricted to the USA. For minimum latency, though, I have client 1 connected to a server in France, and have it configured to route all other traffic on my home network. Problem is, when the router boots, and perhaps due to the order in which the two clients start, all traffic ends up getting routed through US-based client 2. To fix this, I just need to stop and restart client 1. To address this problem, I created another KM macro that that checks the geo-location of my external IP address, and if it’s not “FR”—and if the router isn’t currently rebooting; hence the ROUTER_REBOOTING check—then it restarts the VPN client 1.